Between 2006 and 2011, the USAID | DELIVER PROJECT’s Latin America and Caribbean Regional Contraceptive Security Initiative developed and tested a series of participatory market analysis activities in Honduras and Nicaragua to improve how in-country stakeholders understand and respond to family planning customers’ needs and work to expand the contraceptive market. Subsequently, in 2012, this approach was adapted and applied in Ethiopia. 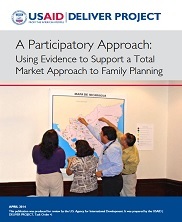 Through this series of activities, the USAID | DELIVER PROJECT developed a participatory market analysis approach. This guide provides background and material to help family planning stakeholders in other countries adapt and apply this approach to their own setting. The process takes stakeholders through a series of six steps to analyze, understand, and use market analysis data to inform family planning policy decisions. As a result, family planning manager’s knowledge about the total market —public, nongovernmental, and commercial—has improved. In addition, family planning stakeholders have increased their commitment to improve service provision and develop concrete, coordinated, and sustainable strategies to reduce gaps in access to family planning services and commodities. JSI / USAID | DELIVER PROJECT, 2014.